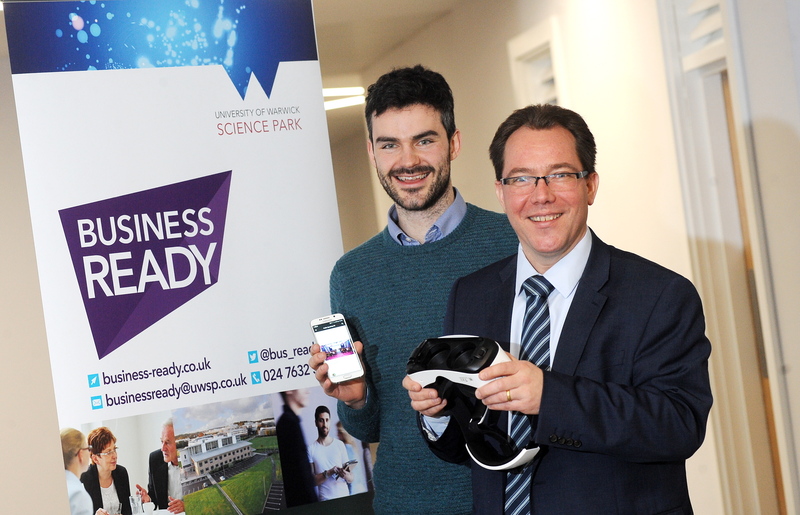 A virtual reality mobile phone app that immerses users into a computer-generated world to help them hone their communication skills has gone from strength to strength thanks to the mentoring, advice and guidance of the Business Ready Programme. VirtualSpeech is a Leamington Spa-based company that is developing virtual reality (VR) apps to improve communication. Set-up in 2016, the application is the brainchild of Dominic Barnard who decided to strike out on his own after working with VR technology at Jaguar Land Rover (JLR) for more than two years. He came up with the idea of expanding the world of VR and creating something that could be used to help others, rather than just being used in the areas of gaming and business applications. Dominic’s work has seen him create an app called Public Speaking VR – which is available to download now. It has been created to help individuals Practice and improve their public speaking, sales pitches, networking skills and interview techniques. It can be downloaded to a phone and then all users need is a pair of the virtual reality goggles (such as Google Cardboard, available for £10) to help build their confidence and help them to ‘wow’ an audience or get the job of their dreams. Although there was a huge amount of interest for the app, Dominic felt that he needed help and advice as this was the first business he had set-up. After searching for the best place to find some support, he was put in touch with the Business Ready programme, which is being delivered by the University of Warwick Science Park as part of the Coventry and Warwickshire Business Support Programme. “I contacted the University of Warwick Science Park after leaving JLR in order to get some guidance on the business strategy,” Dominic said. Dominic was mentored and worked with Dirk Schafer from the Business Ready scheme on various aspects of the business including digital marketing. But something that Dirk recognised was that, although Dominic’s idea was a revolutionary application for VR, the market didn’t seem big enough to give his business enough of a return. The idea for the business needed to be expanded upon and their marketing improved to make sure the firm could be driven forward. “What Dominic has done is tap into a market that has not been used for virtual reality and it is a fantastic and impressive idea,” Dirk said. Working together, Dominic and Dirk came up with a plan for the business and mapped out how to grow it. They came up with the idea to adapt the app to more broadly help users improve their communication skills and have another strand to it with the Language VR app. This is an application for people to master the English language and culture by providing realistic environments to speak, listen and learn in. Dirk added: “We had to broaden the scope of the app, so that it wasn’t just about conquering fears of public speaking and interview situations. “We did this as we wanted to make sure that Dominic and his business had somewhere to progress and make sure that it continued to be viable and relevant. Alongside this, Dominic and Dirk developed and improved the digital marketing strategy to ensure that the message got across to the right target audience. Thanks to the help of Business Ready, Dominic’s apps have already gained a great deal of attention from the likes of The New York Times, Forbes, VentureBeat, Inc. and other top news sites. Not only that, the applications have already been downloaded more than 100,000 times and counting. To capitalise on this, Dominic applied to Boost VC, one of the top VR accelerators across the globe, to work with mentors, develop his networks and attract investors. Only four per cent of applications are accepted for the programme, which is based in Silicon Valley in America, and Dominic and Dirk believe that the fact that there was an already successful app and a solid business plan in place contributed to the application being accepted. “Our support for Dominic and VirtualSpeech continues so we are available to carry on offering advice and guidance to Dominic when he returns to the UK,” added Dirk. Dominic added: “Business Ready has been a huge asset and I am so grateful that there is something out there like this for firms to access.